EXPANDED MEDIA: Congratulation to EIA MFA student Colleen Marie Foley! Congratulation to EIA MFA student Colleen Marie Foley! 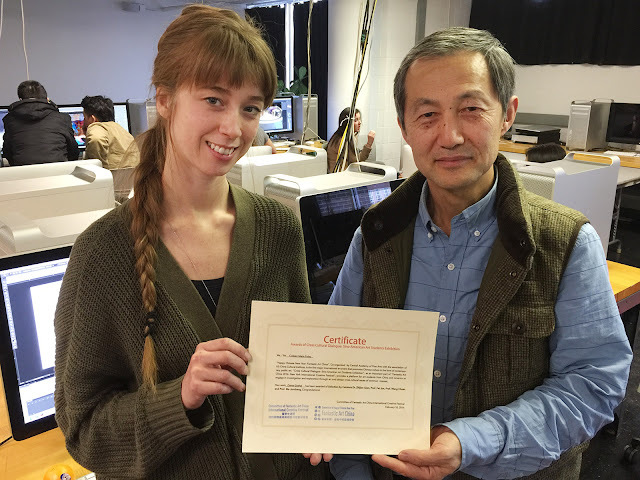 Congratulations to Coco- Colleen Marie Foley-- EIA MFA student for winning Curators Choice Award at last weeks exhibition -- Cross Cultural Dialog: Sino-American MFA Student Exhibition, held at the Javits center in New York City. Xiaowen Chen is delivering the award. Other alumni and EIA students featured in this exhibit include: Yasmina Chavez, Ma Qiusha, Brandon Barr, Rebekkah Palov, Jason Bernagozzi, Eric Souther, Wang Rui, Sondra Perry and You Qi, The Exhibit was curated by Professor Fei Jun - Chair CAFA Department of Digital Media and Professor Xiaowen Chen, Professor of Print Media, Expanded Media - SoAD, NYSCC at Alfred University.